Yesterday while walking down 38th Street in Midtown Manhattan I came across a pickup truck that had striking sculpture attached to the top. It was a recreation of the famous “Lunch atop a Skyscraper” photo by taken by Charles C. Ebbets in 1932 showing construction works eating lunch on a crossbeam during construction of the RCA Building in NYC. 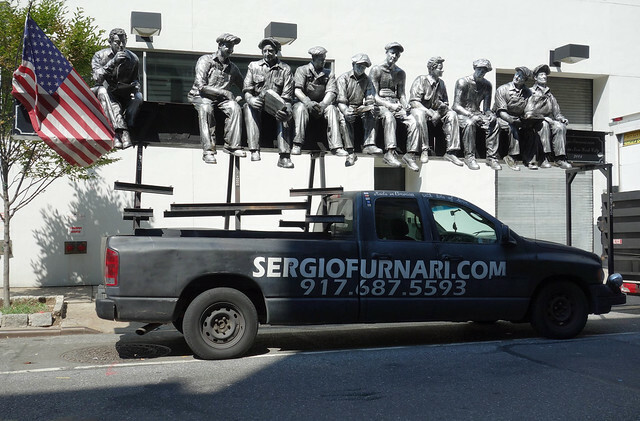 The truck belongs to Sergio Furnari, who creates custom ceramic and terra cotta tiles in New York City.